Rii was running from the shadows of the dark. Every night she ran, knowing that the nightwings were weak in the light and hoping to keep ahead of them if they were chasing her. During the days Rii slept in deep tunnels under the earth trying to keep safe from other rogues or tribe dragons. She kept out of rogue territory purely because she feared that the nightwings were or had already taken over the rest of the rogues territory. She hoped to throw anyone off her trail by keeping to the edges or just inside tribe territory. Her course meandered sometimes as prospects of an easy meal while she was on the run occasionally made themselves obvious to her. It was early morning and the sun would rise soon as Rii crested a high hill top. Rii knew that she had to find a place to sleep in these cold harsh mountains. Digging was out of the question here, for the earth was too frozen to burrow into, and to amke things worse it was beginning to snow. Mountain goats had tempted Rii further into ice wing territory than she normally would go, however they disappeared over a ridge before she could begin a real hunt. Now her foremost worry was finding a place to sleep. Her sharp eyes scoured the mountain side looking for any dark openings or crevices that might be caves. After constantly searching for interesting rocks and minerals throughout her life Rii was able to skim her eyes over the mountain quickly not missing any detail. Eventually she found a cave and quickly approached it. The wind shifted, and a scent caught itself on her tongue as she tasted at the chill air. Stopping abruptly Rii stared into the entrance of the cave unsure of whether danger was near or not. The skull in he right front claw dug into the skin of her paw as she clutched it tightly. Scenting the area for a full two minutes for other dragons, Rii couldn't believe what she had found. A young dragon was inside hidden from view, and she couldn't smell any other dragon scent around that was not younger than a week old. Who would leave a child alone in the cold like this? She wondered angry at the cruelty of her own kind. Just another reason she couldn't trust others easily. She wandered into the cave slowly, step after step, making sure that she couldn't smell any of the child's guardians nearby as she entered. Cold....it was all that accompanied AuSurath. A twinge of pain stabbed his gut, reminding the small hatchling that not only the freezing temperatures where there, but his hunger was there to great him too. It had been several days since he had ventured out of Wisp's cave, having ran out of food. It only took a couple of minutes out in the blistering tundra for him to get lost, spending hours looking for the home, but blinded by the snow. It was only by luck did he stumble across another cave, uninhabited. Despite the dangers of entering a cave, AuSurath gave no care, his frame pale, not from his natural ability to change color, but due to the fact that he was freezing. Walking became impossible, his body vibrating in a feeble attempt to generate any amount of heat to help his survival, but it was all hopeless. No hatchling would ever be able to live alone in this inhospitable environment, much less one not native to the lands. Even inside the cave, he had no hope, the temperatures still below freezing, making icicles form on his snout. In a last ditch effort to find any sort of warmth, AuSurath curled around a single rock in hopes of staying warm. It wasn't long before his body stopped shivering, not from warming up, but from his body shutting down. No longer feeling any pain, the cold slowly drugged the small hatchling into sleep, getting ready to claim another victim in the icy tundra. She reached the back of the cave where the young dragon lay curled around a rock. Her tongue slithered in and out tasting the air and in turn smelling the child. Hello? She spoke gently trying to rouse the child from its sleep. However, as soon as she cautiously touched her nose tip to his body she shivered in dread. Is the child already dead? She thought while quickly curling around the stone and AuSurath trying to warm him. His body was as cold as the stone, and while her firewing half kept her toast warm even in this climate the cold touch of the youth against her skin chilled her. He's not even shivering which means I don't even have time to build a fire...I don't think... Rii shook her head and blew a ring of smoke in the air chastising herself. She then looked to the skull in her claw and nuzzled it before looking to the near frozen child. I can't think like that. My body is warm and shall warm him... She hoped silently before looking to the front end of the cave. Even if she was able to revive the child what then? This was obviously a child from whatever tribe it was she had crossed the lines of. Though she would feel no remorse taking the child from them since death would have taken him from them in the first place. Mairii what should I do? I'm not like our mother. She rumbled looking back to the pitch black eye holes of the tiny dragon skull once again. It lay there frozen as the stone walls around them and silent as death herself. Rii couldn't leave the kid there. She was not so black of heart. Her train of thought then took her to the only obvious answer. I have to keep him... If he survives that is. She then nuzzled Au and was surprised by his leathery skin. It was so soft compared to her own small scales. Unsure of what to make of this, Rii simply lay her head down and waited for something to happen. She groomed her tail fur making it as poofy and warm as she could before sucking off any remaining venom from her tail spikes to make them safe. Then, using her retracting muscles in her tail Rii folded the spikes against her skin to keep them from poking the child. After that she curled the warm fluffy fur covered tail around the young dragon to help keep the warmth trapped there. The frozen earth called to him, blackness and quiet seemed comforting. But that would not be the case, as something hot and warm touched his skin, almost burning him, but in a pleasant way. Unknown to the frail hatchling, an unknown body had curled around his almost lifeless body. Whoever or whatever the heat was, it did not matter, as warmth was warmth to the freezing hatchling. The body heat of the large serpentine dragoness curled around AuSurath's body kick started his systems back in, going from still and lifeless to a small ball of vibrating flesh, shivering in the cold. Barely aware of what was going on, AuSurath shivered as close to the warming object, eyes tightly shut and tail curled around his own small frame. Rii's hopes began to be answered when the stone cold thing resting between her coils and under her tail gradually rose in temperature. She hummed happily then shook her head a hard line creasing her forehead as her eye brows lowered. No no no Rii. Do not get attached... She sighed then looked out at the sky as the light began filtering farther into the cave. She needed sleep. Her journey would not end until she got to the earthwings territory once more. I can think of what to do with this little one when I wake. Rii lay her head upon the ground then closed her eyes readying herself to slip into a light sleep. Slowly waking from the near frozen experience in the nice toasty embrace of Wisp, AuSurath yawned as he slowly blinked his eyes open. Snuggling the fluffy blanket around him, he wrinkled his nose as it tickled, slightly confused as to why this blanket tickled. Looking at the fluffy blanket, it was soon realized that it was not a fluffy blanket, but some sort of thing attached to Wisp. Following the fluff, he once again realized that it was not Wisp, but something else, something with a not dragon-like head, and long serpentine body. Realizing that it was not Wisp, it could only mean one thing, that this must have been the scary monster under his bed, and was going to eat him. Screaming, which was more of a hoarse yipe, AuSurath fled away from the fluffy and warm tail to the end of the cave, "M-Muuunsttteeeerrr!" he yiped as he ran to the corner of the cave cornering himself as he looked at the thing that was definitely going to eat him. Rii woke up startled as movement beside her and a shrill scream dragged her from sleep. She raised her head blinking away that dirt that gathers at the corner of your eyes as you sleep. Then she gazed over at the young dragon who was now very lively. Mairii the skull lay back against the wall where Rii's claw had let go of it as she slept. Thrilled to see him moving so much Rii felt relief spread through her heart and mind. She had gotten there in time apparently. Her eyes traveled over the young dragons body evaluating its health and vigor. She shivered at the sight of it. Uncurled from the rock it had been sleeping around and in full view of Rii now was a species of dragon whom Rii was running from. The child quite obviously had nightwing lineage, but how much she did not know. It's green eyes captivated her though. Those precious gems glimmering in fright at her form sent a shiver down her form. Never did Rii want to see a baby scared of her like this. ...but now what do I do...? the bluish dragon moved slowly so as not to scare the child any more than he already was. She glanced at the skull sitting against the wall behind her and sighed. Mairii would have tried to make friends with the little guy. Wanting to calm him and eradicate that fear from his gem-like eyes, Rii hummed softly and lowered her head to his level. I won't hurt you little one. She said gently blowing out two hoops of brownish black smoke from her nostrils. She blew at the smoke until it dissipated then smiled softly at Au. My name is Rii. What is yours? Her question fell into the cold air before the woman pauses observing the young dragon. AuSurath's heart hammered in his chest, staring as the snake moved and looked right at him. The blue furred creature looked at him, as if it were deciding to eat him in one or two bites. He knew Wisp told him monsters under the bed did not exist, but there was one here now, and Wisp no where in site. He couldn't, however, help but **** his head to the side as he heard a humming sound come from the creature, piquing his curiosity. Sniffing the air slightly, he noticed that the scary bed monster was female, and heard that her name was Rii. Just as he was calming, he saw the flesh dissolving smoke come out, causing him to meep. Once it dissipated, and surprisingly his face not melted off, he tried to answer, but was nervous, and cold. "m-my n-nam ees Auooath," he spoke, shivering softly as he looked at the fluffy bed monster and the warm fur, "p-pweese dun eet meh mees Rwii,!" he spat out suddenly, hiding his snout behind his tail. Ay-you-wath? She tried imitating the sound he made that was somehow the little one's name. She held back amusement at her own trouble of pronouncing it as well as the young dragons trouble. Then a frown creased her face as she saw Ayoo shiver. I promise I'm not a monster, and I promise I won't eat you. I like deer meat better. She answered while flicking her fluffy tail, with its spikes still safely tucked away, in a gesture that beckoned the young dragon closer. Rii was glad that she could understand some of the words coming from the little dragons mouth. Come here and warm up. It's cold out, and I have songs I can sing you or stories to tell.. She stay laying down showing the nightwing child that she meant him no harm. The bulk of the stories she had were from her parents when she was little, and Rii knew that Mairii would enjoy hearing them again. She also knew that this little one would enjoy them. Vexilas had been flying with some friends but suddenly they had appeared in Icewing territory. Vexilas, Maybe we should go back?" Vexilas looked at the friend and said, ”Are you kidding? This is the most fun!" Vexilas looked around and saw that all his friends had disappeared. Vexilas sighed. ”And they have gone back, like usual…" Vexilas being super bored dive bombed into the snow. He spiral and hit the snow as hard as he could. He immediately was freezing. His body temperature was really high, but that could only last for so long. Vexilas saw a cave a few feet away. He began to crawl into it. He wasnt smelling or listening so he had no idea if something was in there. AuSurath stared at Rii as she tried to pronounce his name, pouting, but at least happy to hear she wasn't the bed monster under his bed and that she wasn't going to eat him. Trotting up to Rii as she was definitely warmer, and stories were always fun, he still pouted as she mispronounced his name like everyone did. AuSurath never could figure out why everyone had such a hard time saying his name, it wasn't that difficult! "Nuuu, my name nu dat, it Authooath!" he pouted, but did lay down against Rii's fluffy blue fur that felt warm against his scaleless hide. Looking up at Rii, he was slightly hungry, but refused to acknowledge it as there was story time! Rii stifled a chuckle as the younger dragon became annoyed at her mispronunciation of his name. She tried again saying "Awooath?" hoping that she might get it right. She felt a warmth creep into her chest as the child came closer and eventually lay upon her furry tail. She flicked the end of it so that it lay over the lower half of Au's body. Every once in a while as was normal Rii let her tongue slide in and out tasting the air. She readied herself to tell a story trying to think of the nice tales her father spun when she was sitting in the nest. There was once a young dragon who loved flowers. He was dull dark brown in color and had sad little horns. This dragons name was Totem. He.... Rii paused as her flicking tongue caught the hint of a taste and scent of another dragon in the area. She looked towards the entrance of the cave and became very silent then softly shushing Awoo in case there was danger approaching them. 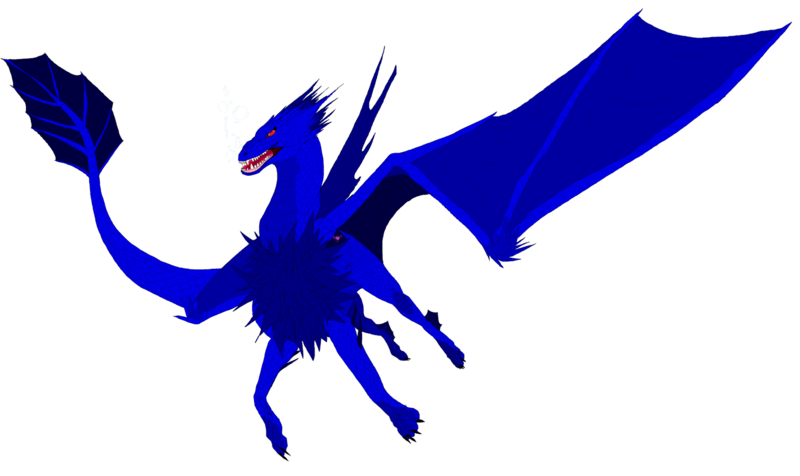 Her tongue flickered in and out tasting the air allowing Rii to identify that the newcomer was just a hatchling. Relief and surprise emanated from her as she stood up to stand between Awoo and the newcomer. Sorry Awoo we'll have to wait on the story until we know this other dragon is safe. She explained softly close to the nightwing child's ear then stared at the tunnel waiting for the other hatchling to appear. Come out where we can see you. I promise you I won't hurt you. Rii called out to the newcomer still wary. She wondered if this other dragon was a sibling of the child she was currently caring for. He could be an older sibling, since it seems he can fly. I don't think this little one can fly just yet. Rii thought while waiting to see the firewing dragon. 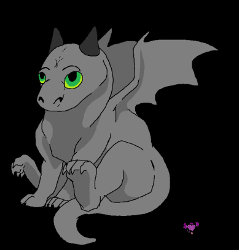 Vexilas squeaked as he realized there was a dragon in the cave. He almost turned and fled. He stood up and stuck out his chest for three seconds. Then his chest deflated and he began to shiver. He really wasnt used to this whether. He walked over to the dragon. He now realized it was serpentine. That meant it could strangle him in his sleep with its tail. ”Im sorry for bothering you, I just needed someplace to kepp warm… Ill leave and go find another cave." Vexilas sat down, completely forgetting about what he just said. He saw a skull on the ground and almost screamed. With his hind quarters covered with a fluffy, warm tail, AuSurath practically straight up at Rii as he waited for the story to begin. His eyes were still wide with uncertainty, having never seen someone like Rii before, but the fluffy fur was too nice to leave. Besides, she smelled nice and seemed nice enough. Picturing a brown dragon laying in a field of purple flowers, Au looked and listened as Rii began the story of Totem, only to stop it and once again mispronounce his name. Forgetting the whole danger side of another dragon being nearby, AuSurath pouted, "Nuuuuu, mai name nu dat, eet Ayouath!" His snout wrinkled up into a pout as he glared two little emerald daggers into Rii, until he heard the voice of another. Realizing the voice wasn't his own, and definitely not Rii's as he didn't feel her vibrate from talking, AuSurath tilted his head to the side, wondering what could have made such a silly noise that did not come from his own maw, or the maw of miss story teller. Rii flinched as Awoo spoke despite her shushing of him. At least this other dragon was a hatchling. Small dragons she could deal with but not big ones. It was also rather lucky for them that this young firewing only seemed to be cold and wanted a place to stay. She relaxed a bit then flicked her tail once gesturing for the other dragon to come closer. You can stay so long as you don't mean us any trouble. What is your name? Rii asked gently before following the young firewing's suddenly frightened gaze to Mairii's skull. She picked up the skull with a free claw then hid it in her firm grip. Don't worry about the bone little one. She won't harm you. Rii tried to calm the other hatchling. The way he had talked earlier made her think that he was not some relative of Awoo, else the firewing child would have recognized the nightwing child. However that answer made Rii wonder exactly why a firewing child was flying around in freezing mountains. Where were his parents? Or did he have any? Those questions plagued her as Rii waited hoping to calm the young one before asking him about his family. Vexilas stood up and puffed out his chest again. ”Im not scared of a stupid bone! Im not a kid!" Vexilas puffed smoke out and finally saw the other hatchling. ”Whats wrong with him?" AuSurath pouted at Rii's silly question, and bit her fur, then started spitting the fur from his tongue as it tasted bad. "I tooool you! My nam ees AYOUAT!!!!!!!" he spoke loudly, for a hatchling that is. He had already told RIi his name many times, and her mispronunciation was starting to grate on his nerves. Climbing from her coils, he was about to get mad at her when he noticed the other red dragon. In shock, AuSurath yipped and fell back on her fluffy body to hide. Rii looked down at the other red colored hatchling and smiled warmly. She imagined Mairii asking him and Awoo a lot of questions and trying to get them to play with her. She wondered for a moment if all of them would have been friends. At least now he didn't seem perturbed by her existence, even if Mairi was no longer living. Oh well, I can't seem to say his name correctly, and I'm so sorry for that... She looked back down at Awoo who was trying to eat her fur or something hoping that he had heard her apology. Then she chuckled as he spit out the blue strands of hair and finally noticed the red hatchling. After Awoo hid back under her tail to hide from the newcomer Rii suppressed a massive urge to nuzzle the young hatchling. She had to close her eyes for a moment and sigh before looking back to the firewing. What is your name and where are your parents? Do they know you are out here? Rii questioned the red dragon peering at him inquisitively with her crystal-like blue eyes. She hoped that she wouldn't have to take another hatchling along with her. Awoo was one thing, it was clear that he would not have survived had she not arrived and also clear that the young nightwing could not take care of itself entirely yet. However this red hatchling was already flying, and could reasonably survive on its own like she had once a long time ago. Rii would rather not have to deal with two hungry mouths to feed. Looking back down to Au she cooed to him. Come now he's not going to hurt you. Especially while I'm around. She tried to reassure the child before draping a wing over both children to keep them a tad bit more warm. Her wing blocked the chilly draft that was coming in from the opening of the cave. Vexilas stared at Rii.”No they dont" Vexilas clawed at the walls of the cave and tore off a chunk of rock. Vex then blew fire on the rock. For thirty seconds. Vex then laid on the rock, saw the tiny one fall, and said, ”My names Vexilas, and why is he scared of me?" Peeping his head up from Rii's body to peer at the other hatchling, he watched with just his head showing, despite what was being said. While the little red and big blue talked, he clambered up the rest of Rii's back and laid down on it, his skin turning more blue as he laid there, looking over a the red hatchling that was spewing fire. Now that the initial shock of everything was wearing away, AuSurath shivered and hugged Rii's back. "Col n hungwy" he said as he nuzzled against Rii's soft blue fur. He did not remember the last time he had eaten nor been in a warm environment where he could just run around. Well, he actually did, but could not remember how long ago that he was in Wisp's cave with the hot spring. All the excitment was wearing on him as he let his head rest on Rii's back near her wings. Perhaps it was because you are new to him?I am sometimes scared of newer bigger dragons myself. It is only natural to fear someone bigger than you. Rii answered the red dragon before looking down to sniff at Awoo who was climbing over her back now. Glad that the red dragon's answer seemed to elude to him having parents, Rii did not have to worry so much for the other youngster Vexilas. Especially when she saw him roast a stone with flame then curl around it to keep warm. Then her gaze turned back to Awoo. She watched in amazement as he changed color almost matching the hue of blue that her fur and scales were. Interesting. She thought quietly before hearing the now blue colored hatchling complain about hunger and the cold. She shared his complaints feeling rather chilly and peckish herself. When night time comes we will leave this cave okay little one? When we get to the base of the mountains where the trees grow I'll try to find us some food. She said gently while rolling about the smooth skull bone in her claw. Then she shifted her body, careful not to move the section that Awoo was perched upon, and re-positioned her warm tail fur over the youngster to keep in the warmth from their bodies. Until then, why don't we invite Vexilas to join us for the story? She asked Awoo before looking over to the red youth with a raised brow. Would he be interested in a story? She wasn't sure. Vexilas ears perked up as he heard her invite him. He looked up excitement in his eyes. He looked at the hatchling and frowned. "Does he need heat?" Vexilas rolled over te rock and smiled. Hearing that there would be no food until nighttime, AuSurath scrunched his nose in disappointment. But he did enjoy having the fluffy tail go over him, even though the hairs tickled his snout into sneezing once, but after that, the hair was clear from his nose. While chilled, the furry tail did manage to keep some heat in, which would be good enough for him for the moment. Listening to Rii bring up the idea of story time, having been interrupted by the newcomer, which reminder AuSurath to peek out at him with one eye, before looking back at Rii and nodding. " 'tory time," he said, affirming to Rii that he wanted to hear the story, wiggling to get a little further into the fur of Rii. Rii looked over to Vexilas nodded silently to answer the boys question. Yes AuAth needs to be kept warm. I am afraid of doing what you have done and warming a rock with my fire for fear of making the stone too hot. His skin is so frail compared to dragons with scales... Rii touched AuAth softly marveling at the soft yet leathery feel of the young dragon's taut skin. After answering the red dragon and nodding at AuAth she tried to recall how the beginning of her story went. As I said before. There was once a young dragon who loved flowers. He was dull dark brown in color and had sad little horns. This dragon's name was Totem. He was smart, kind, gentle, and best of all he liked to listen to his surroundings for the songs of nature put joy in his heart. She paused recollecting a part of the story her brother had often told her. Other dragons thought him strange for being so quiet, and ugly for having such murky brown scales. They bullied him knowing that he was small and that his horns could not hurt them, and all of the females ignored Totem when he attempted to greet them. For the females were the only ones who did not bully him with physical force. Only their hurtful words tore through his heart and mind. He still tried to speak with them since they did not force him flat to the ground and trample over his hide like the other boys did. She continued pausing again to make sure both hatchlings were still listening.